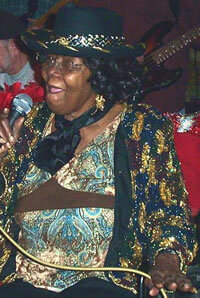 Cotton-Candy was born on New Years Day in 1931 and passed away December 28, 2007. 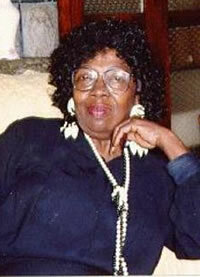 She was a charter member of the Kansas City Blues Society, and inducted into the Elder Statesmen of Kansas City Jazz in 1992 and a Gold Card member of the Mutual Musicians Foundation since 2002. In the same year, she received a proclamation and a resolution in Harrisonville, Missouri, Kansas City, Kansas and Kansas City, Missouri, in honor of her past contributions to the area music community. Annetta was a songwriter, arranger and poet – creating many original tunes to include They Call Me Cotton-Candy. She was a recording artist and has several recordings to her credit to include live performances in Europe and the United States. 1998, Cotton-Candy and So Many Men were voted Best Blues Band in Kansas City and the same year, placed third in the International Best Blues Band Contest in Memphis, Tennessee. She was a regular performer for many years at the 18th & Vine Heritage Jazz Festival, Kansas City Blues and Jazz Festival, Kansas City Spirit Festival and Kansas City Kansas Blues Festival. Ms. In 1971, Annetta former her own gospel singing group and served as minister of music and a Sunday school teacher at Kansas City, Kansas’ Fellowship Prayer Temple. Washington-Shefton was a gospel pianist and a vocalist in her own right. An amputee since 1984, Cotton-Candy worked tireless to assist other disabled citizens through the Amputee Coalition of America. She performed at the ACA national convention in 2000 that was held in Reno, Nevada. After losing a leg to diabetes in 1984, Washington-Shefton worked tirelessly to assist other disabled citizens through the Amputee Coalition of America (ACA). She performed at the ACA national convention in 2000 that was held in Reno, Nevada. Washington-Shefton suffered a stroke on December 15 while performing at a breast cancer benefit at Blayney’s blues club in Kansas City’s Westport bar entertainment district. She passed away less than two weeks later at the age of 76.